The book revolves around two characters, Audrey and Marcus. Audrey takes matters into her own hands as she searched for a missing girl. Little did she know, she would need to enlist the help of a popular biker gang that goes against everything she stands for and believes in. As she tries to unravel the numerous clues, leading to the girl's disappearance, Audrey’s romantic senses awaken. She finds herself caught up in some romantic chemistry with Marcus, the biker gang leader. However, she also faces a dilemma that may either force her to succumb to a game theory that could ultimately lead to her demise and that of her loved ones. This love and passion is belligerent but she has a choice to make. What will she choose? 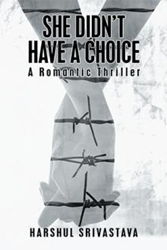 “She Didn’t Have a Choice: A Romantic Thriller” gives readers something more than just two-dimensional people working through a thrilling adventure. The romantic chemistry between Audrey and Marcus will peek into their past and bring out their emotions. Harshul Srivastava grew up in Delhi, India and then later moved to Dubai where he completed his high school. He then moved to Canada to study at University of British Columbia at Vancouver from where he graduated as an engineer. After working as a professional engineer, he decided to pursue his Masters in Finance from the prestigious Harvard University, U.S.A. He got interested in writing while at Harvard and started writing articles for online publications. Later, he co-founded Asian Entrepreneur Magazine, an online business magazine focused on promoting and providing Asian entrepreneurs a platform to express their stories. It was then when he decided to write and publish his first novel.